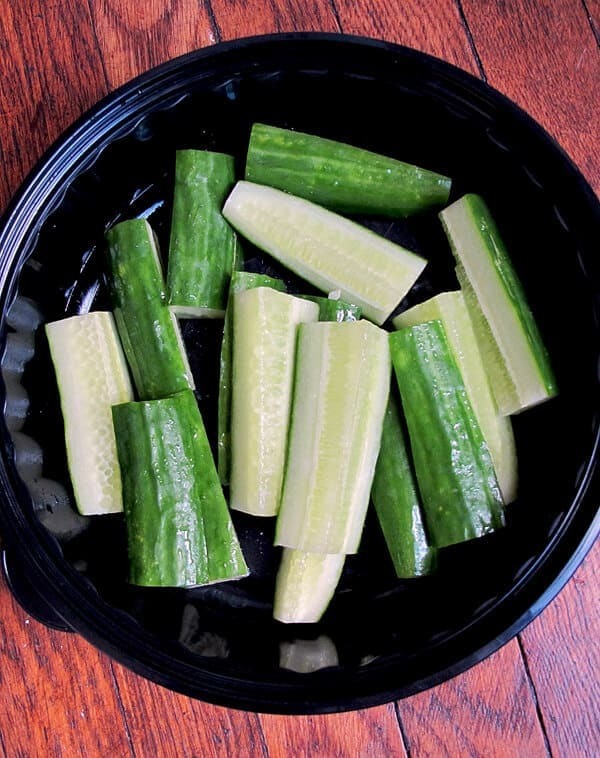 No need to ferment these cucumbers before you can eat them! 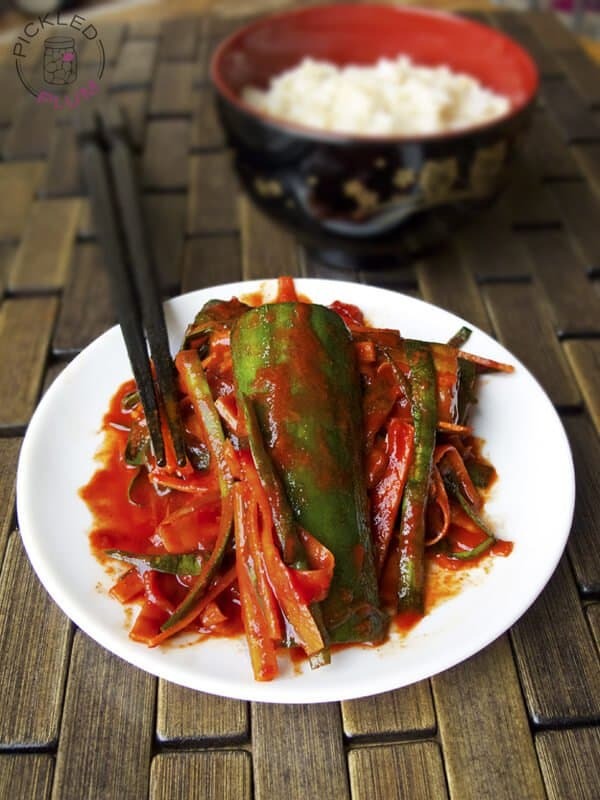 This is a 15 minute Cucumber Kimchi Recipe that’s fizzy and pungent just like the real thing! In keeping with my promise to make more pickle recipes this year, I’ve come up with an easy and delicious Korean classic: cucumber kimchi. 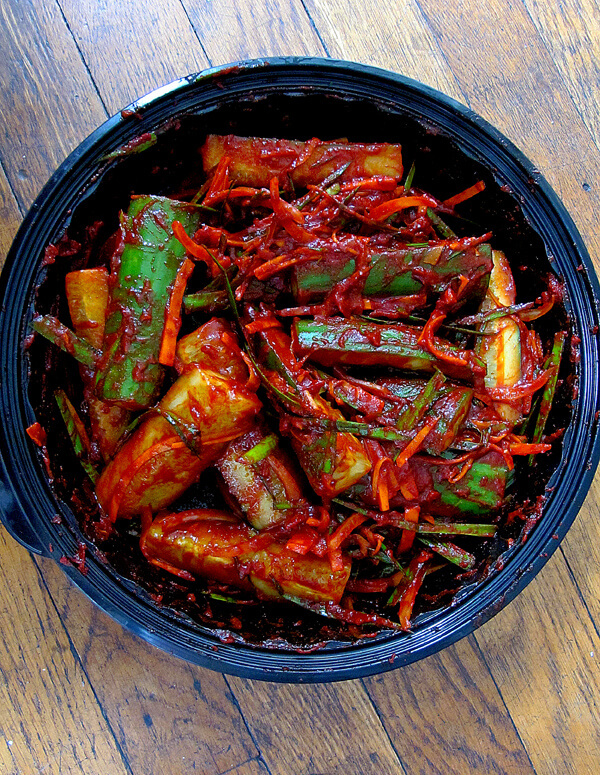 This cucumber kimchi recipe is much more pungent and spicy than its Japanese counterpart (e.g., pickled daikon) and because of that, contains higher levels of nutrients and vitamins. Kimchi is also known to be one of the top anti-aging foods and has been the latest beauty trend among Japanese women for the past few years. It’s known to decelerate the cells aging process from 54% down to 25% – how amazing is that! Another quick health fact about kimchi: it’s packed with good bacteria which protect against certain cancers and help with digestion by cleansing the digestive tracts. Looks like kimchi is more than just delicious, it could be called a wonder drug! I first tried kimchi during my days living in Japan and my reaction was a mix of ‘WTF!’ confusion and wonder. Describing the taste is almost impossible since there’s nothing else like it out there. So what is kimchi and what does it taste like? To me kimchi is very garlicky, almost fizzy, fishy and spicy. You either love it or hate it, there won’t be any mixed feelings about it! It’s an acquired taste that can quickly become an addiction. My brother loves it so much that he used to keep a giant jar of it in our fridge when we were teenagers. It stunk up the kitchen like you wouldn’t believe but thankfully, my mother and I also love kimchi so we were fine with it. If we knew back then it was this easy to make we would have laminated this cucumber kimchi recipe and permanently pinned it to our kitchen cork board! This cucumber kimchi recipe is quick and doesn’t need to sit for days before it’s ready to eat. You can either make it right before serving it or a few hours earlier if you prefer the veggies to be softer and more pickled. Now, I’m no kimchi expert but this quick cucumber kimchi recipe does taste like the real thing and is truly delicious and addictive. Once I got the hang of creating basic kimchi like flavors it was hard to stop myself from whipping up dish after dish of spicy red goodness (like this super simple and quick kimchi soup). The only downside were the red stains left by the hot pepper powder. Many of my white plastic tupperware (mostly kept from ordering Chinese) had to be thrown out. No biggie, I’m wiser now and use black instead of white. 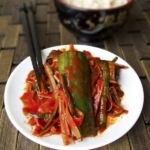 Serve this cucumber kimchi recipe with oven baked Korean chicken wings and a bowl of brown rice for a healthy and savory dinner. In a mixing bowl, add all the ingredients for the sauce and mix well. Pour the sauce over the vegetables and using your hands (covered with gloves) or a spoon, spread/mix evenly to coat the vegetables. Serve immediately or leave for a few hours for softer texture and more infused flavors. Just made this recipe and loved it. I will definitely be adding this recipe to my favorites. This is my second time making this dish. My husband and I just loved it! I added this time some ginger and cilantro. Thank you for sharing this recipe. I’m very happy to hear that! Thank you for letting me know and thank you for the cilantro and ginger tip, I’ll be trying that next time! Do you julienne the ginger? Hot pepper powder–is this the same as cayenne? Hi Kimberly! It isn’t cayenne pepper, here is a link to what you need http://www.amazon.com/gp/product/B004W71CJU/ref=as_li_tf_tl?ie=UTF8&camp=211189&creative=373489&creativeASIN=B004W71CJU&link_code=as3&tag=nyfobl-20 it’s called Gochujangyong gochugaru, you can find it in most Asian grocery stores. Thanks so much for the cucumber Kimchi recipe! 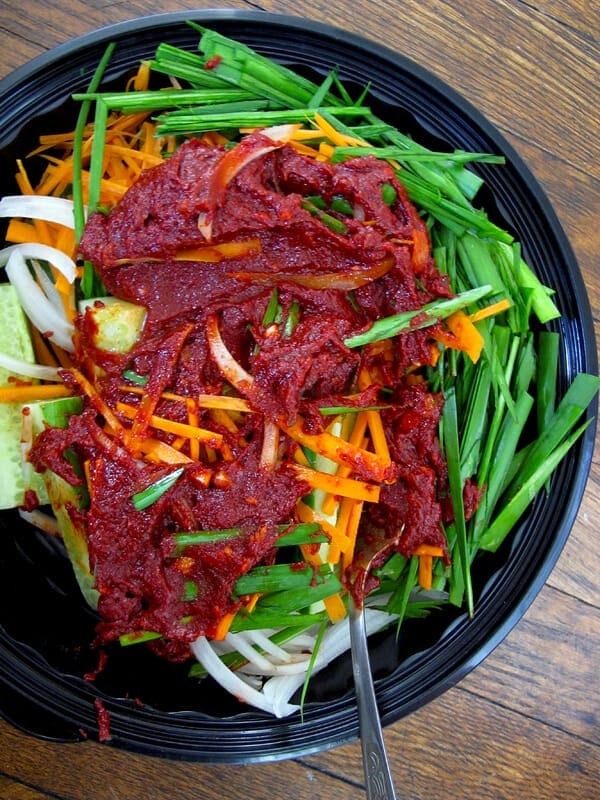 I’m making Anita Lo’s Bulcogi recipe tonight, from my own web site Pannacooking (https://pannacooking.com/recipes/bulgogi-korean-bbq) – I swear, I came here looking for a Kimchi recipe, but then I thought “Maybe these nice people would like to hear about my attempts to learn to cook Korean food and at the same time get them to check out Pannacooking.com?” – but then I thought, probably not. Check out the site anyway. And if anyone goes to the site, and contact Support and asks for a FREE subscription, using the secret words “Jordan Sez” – then I will personally comp you a free subscription to unlock the entire site. I have all the ingredients and plan on mixing some up tonight! I l-o-v-e kimchi. The spicier, the Better! Thanks, for ur recipe…I was eating noodle n my urge to eat it grow n just checked the recipe. … I’m glad ur recipe is simple. …As I’m vegetarian I don’t want to add the fish sauce so could u please tell me what I can add ….. lastly how long can it be stored? ???? Regards..sangay..
You could try using a mix of white miso paste and light soy (it’s saltier than regular soy sauce). The recipe calls for 4Tbsp fish sauce, start with 1 tbsp light soy and 1tbsp miso paste, give it a taste and adjust from there. I’d love to hear the result, keep in touch! I love the addition of chives and the way you cut them for this salad, I will definitely try this! I am sorry to be a smarta**, but this has nothing to do with kimchi and its health benefits – those come from the fermentation. 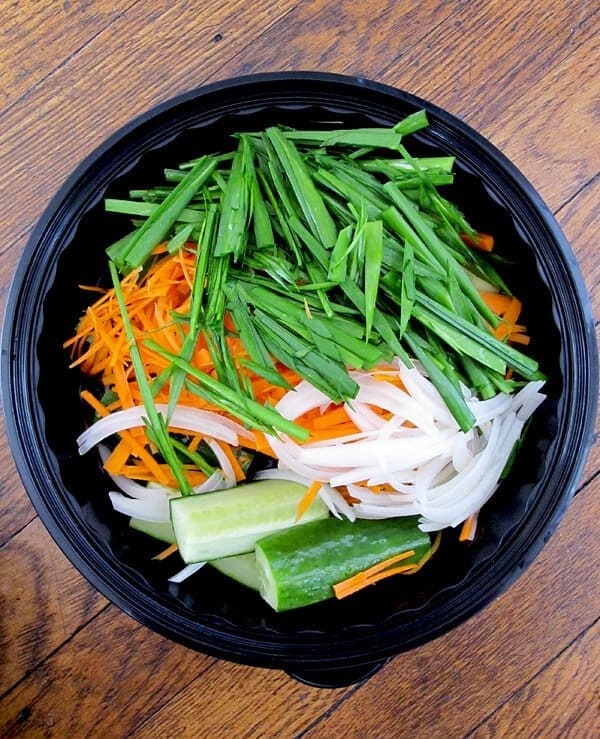 But this is a great looking korean salad, nonetheless! 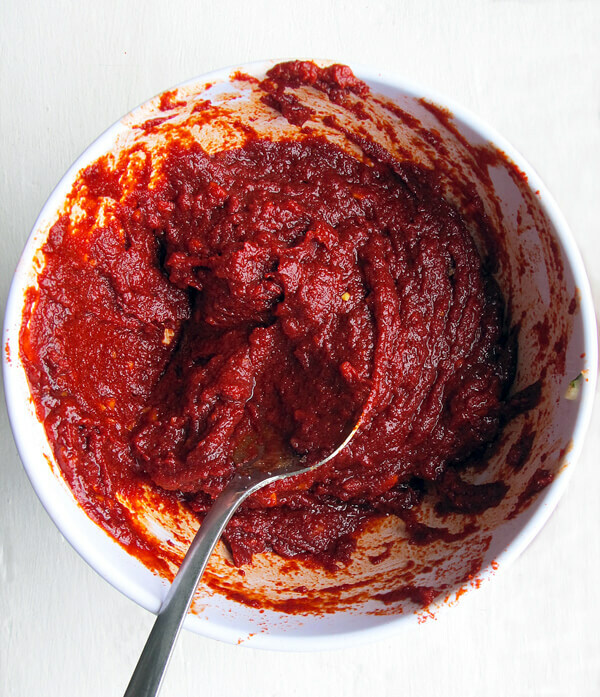 Glad you like the recipe, it’s so delicious and easy to make 🙂 I agree with you on the fermentation process (no apologies necessary about the smarta** comment :)) but hot pepper powder alone is also extremely potent and contains the same benefits. All the better for our skin hehe! Thanks Trisha! Your pastries make so hungry! Just love kimchi. Your dish is so inviting, and I am glad I decided to stop by your page after seeing this on foodgawker. Thank you Asha! I also love your blog, your pictures are stunning! !